Our house is off-grid! By this I mean that since we started travelling in Blu we haven't had to plug it into a main power supply (although we can). Our solar panels and battery have so far proven to be enough! Despite having electric machines for coffee, laundry, and vacuuming. As I have mentioned previously, we put as many solar panels on the roof as we could fit. That happened to be 13 flexible 100 watt monocrystalline panels. We chose flexible panels because they're light and don't involve glass, and they happen to come as monocrystalline panels. This 1300 watts of solar panels harvests energy and, via two 50 Amp controllers, delivers it for storage to a big 600 amp hours lithium battery. Then, for 240v household energy, some of the power goes through a 'Pure sine wave charger inverter' (which can also charge power to our battery from a mains power source), other power is consumed as 12v/USB.. The battery was custom made for us in China and it seems to be holding up well. For me, buying the battery from China was especially scary! It was a large sum of money that we sent to China.... and there were times that I wondered if we'd ever get our battery. The Chinese company were actually very good to deal with and did provide us great service, specifically talking to us about our needs and available space and building a battery to suit. It's a heavy battery! It's in its own metal box with BMS (battery management system) and weighs about 110kg. 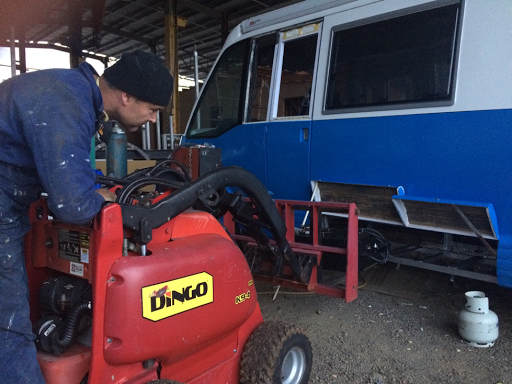 Installing the battery with a Dingo mini digger with forks. Once it was all set-up it wasn't without problems. The first problem we discovered was that one of the charge controllers was failing. They are from Victron Energy and you can buy a cable to connect the controllers to your computer (or an alternative sends info to a smart phone) and from there you can conveniently look at what's going on. Having discovered that one wasn't working we were able to return it for warranty. But, we still had another problem. Our 'starter' (engine) battery swelled. The first we knew of it was a terrible sulphuric type smell, and at first we simply thought that the seaside village we were visiting stunk! But it turned out it was our battery. We thought the problem was caused by the faulty controller, which we'd sent away for warranty (and so were then operating on only 6 or 7 panels), so when we replaced the lead acid battery we didn't expect anymore problems. But, just days before we received our replacement controller, as we drove down the road we heard an incredible BANG! 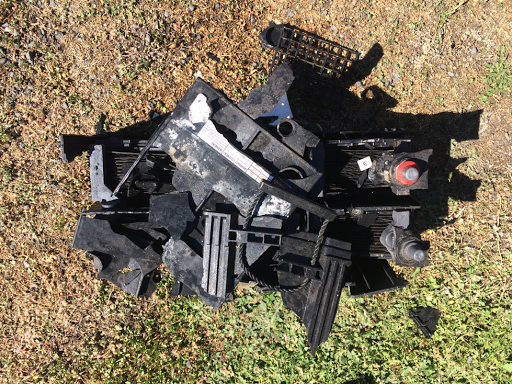 We were still driving (diesel) so we pulled over to discover our new Lead Acid battery had completely exploded. We were very lucky, we were out of town when it happened and no passing property, people or ourselves were injured. Also lucky that on our bus this battery lives in a compartment under the bus, below where the driver sits (so not in the engine compartment where it would have done more damage). Here's what our exploded battery looked like! We isolated the problem (to avoid a potential fire hazard), and with the help of a passing motorist (to get us started again) we were able to drive to a place where we could buy and install another battery, and get our electric system checked over by an auto-electrician. We were also lucky that the parts shop we stopped at was privately owned and had a large yard behind the shop where H was able to do the battery replacement, we were permitted to stay the night, and the auto-electrician could visit to check things over. (We didn't even want to start the engine until we'd had a qualified opinion). So, what was the problem? Well, H, having installed lead acid batteries in motorhomes before, installed it as he would have with those: with the Lead acid system and the lithium system interconnected. But, apparently this is a no-no. So now they are insolated. To charge the lithium battery our option is solar or mains power, and the alternator charges the Lead acid battery. Throughout all the setup and troubles we were greatly assisted by a friend, Roy, in Germany. His advice, on email, was exceptional (he's somewhat an expert in the matter www.infinitefingers.com. ). Since replacing that battery, disconnecting the systems, and installing the replacement controller we've been operating without problems. As I write this it is almost 5pm on a particularly hot Aussie summer day. I've made 4 cups of coffee in a Philips Senseo machine, done 3 loads of washing, vacuumed the floor, had the fans running all day, the fridge has been working hard, and we've been parked in the shade since 11am. 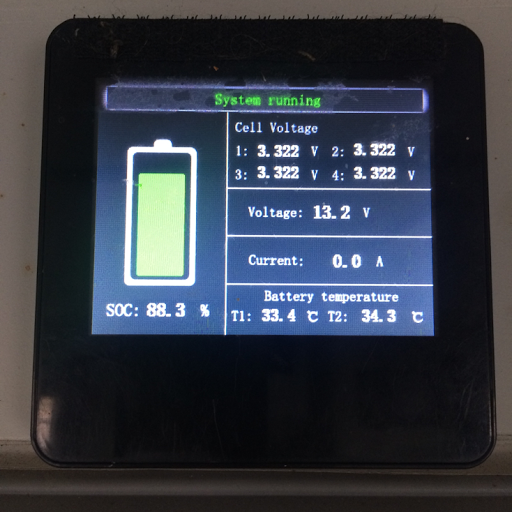 Our lithium battery screen (handy) says it's at 88.8% SOC (State of Charge). We reckon that's pretty good. This is the screen for the battery. We had to put a strip of Velcro on the top to attach a cover at night when it attracts insects. The 600 amp hours lithium battery is from 'PL Energy Group'. Our 'Pure Sine Wave Charger Inverter' is from "Cosuper". Special thanks to Roy (www.infinitefingers.com. )(as mentioned above) and to the old Dutch guy 'Theo' with the parts shop in Bendigo. No point mentioning names, he's sold the shop and retiring.